With the album cover for All 6’s and 7’s has come a lot of comments, commendation, and criticism. 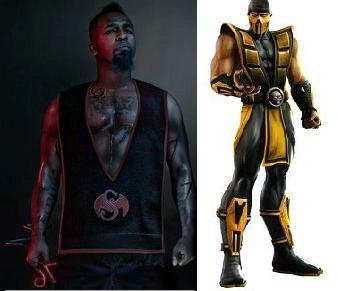 One of the more colorful notions is the idea that Tech N9ne looks like a character from Mortal Kombat. Here he is pictured to the left with Scorpion, the one famous for his grappling hook and his command to “get over here!” The notion has caught on so much that there is even a Facebook group called “Make Tech N9ne as a playable character in the new Mortal Kombat game.” Check out what the fans are saying on Twitter below! What would Tech N9ne use for his fatality? Who’s your favorite Mortal Kombat character?